During the 1950’s road trips became a popular method for family vacations. This was due partly to the rapid growth in automobile ownership by American families, and partly to improved highway infrastructure across the country. As a result of this in-car travel, many businesses and services popped up along the roads to provide refreshment and entertainment to these cross-country travelers. of course The World’s Largest Buffalo in Jamestown, North Dakota just off highway I-94. This huge Buffalo was built in 1959, the first giant sculpture to be built in North Dakota. The Buffalo is 26 feet high, 46 feet long and weighs as much as 10 large trucks. 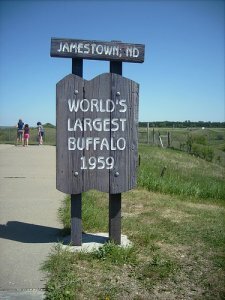 Jamestown, ND has been nicknamed ‘The Buffalo City’ thanks to its famous attraction. Despite being over fifty years old The World’s Largest Buffalo does not have a name. The sculpture was created using steel beams, wire mesh, stucco, and cement. College art instructor Elmer Paul Peterson designed the magnificent beast at a cost of $8500, almost twice its original estimated cost. When completed, The World’s Largest Buffalo was dedicated by Presidential Candidate Nelson Rockefeller. The National Buffalo Museum and a live herd of buffalo are located at the sculpture site. The herd includes one rare albino buffalo named White Cloud. 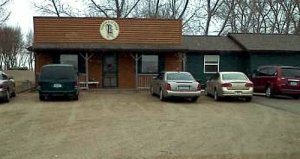 In 1965 a historic frontier town was built nearby to celebrate North Dakota’s early settlers. Thousands of tourists visit The World’s Largest Buffalo every year, free of charge. Whether you’re an area resident or just passing through to see the sites, stop by Comforts of Home and say hello. We have a great selection of fabrics and notions, and we're always excited to meet other people who share our passion for quilting.